With this in mind Warhol’s Head After Picasso of 1985 presents a unique opportunity to acquire a very rare painting by one of the twentieth century’s most well known artists. Head After Picasso originally existed in Warhol’s private collection and has never been exhibited. The painting will be included in a forthcoming volume of the official Catalogue Raisonné of his works being compiled by the Andy Warhol Foundation for the Visual Arts in New York – the exhaustive research is currently occupied with the artist’s works of the Seventies. Warhol’s painting arose out of a commission from the highly respected New York collector, patron and art dealer Alexandre Iolas (1907-1987). Iolas knew Warhol from the age of seventeen and offered him his first New York gallery solo exhibition of paintings seven years later in 1952 (Bodley Gallery). Curiously, both Iolas and Warhol died during the same year, just four months apart. Iolas was an artistic force of considerable magnitude and he established highly influential galleries in Athens, Geneva, Madrid, Milan, New York and Paris. His life and cultural contributions were recently the subject of a celebratory retrospective exhibition at the Paul Kasmin Galley in New York (Alexander the Great, 515 West 27th Street, Manhattan, 6 March-26 April 2014). Iolas commissioned Warhol to create a very limited series of paintings “after Picasso” for an anonymous private client. Warhol liked the idea so much that he extended the series beyond the six paintings purchased by the private collector and made a small number of drawings and paintings for his own collection. These painted homages to Picasso were never exhibited in Warhol’s lifetime. In 1997, the Andy Warhol Foundation in New York organised an exhibition of some of them at the Thaddaeus Ropac Gallery in Paris and Salzburg with a catalogue essay by the eminent Picasso scholar Robert Rosenblum (1927-2006). Picasso never visited America, yet his influence and reputation there were overwhelming. Warhol admired him from the early Sixties onwards. Needless to say Picasso’s paintings and sculptures are very well represented in American private and public collections. A short walk from Warhol’s studio could provide him with a face-to-face encounter with some of the best Picasso works available anywhere. His famous painting Guernica of 1937 was “rescued” through a semi-permanent loan to the Museum of Modern Art, the gallery that now houses the artist’s proto-Cubist masterpiece Les Demoiselles d'Avignon of 1907. The exact reasons for his extraordinary gesture are unclear but Picasso donated a very large sculpture to the city of Chicago – he always said it was because he loved all those early gangster movies. The much-appreciated landmark sculpture was publically dedicated in the city’s Daley Plaza on 15 August 1967 – notably, Picasso refused a payment of $100,000 and any in lieu recompense for his gift. Warhol’s Head After Picasso of 1985, was completed twelve years after Picasso’s death when the artist was fifty-seven, just two years before his own death. Warhol was at the height of his more “mature”, more freehand, late phase. The painting is created with synthetic polymer paint and silkscreen ink on canvas and represents an aesthetic consideration of the style and broad-brush approach of the artist he had long admired. Warhol’s Head After Picasso exhibits the same “opened-out”, loose and free paint-handling found in Picasso’s paintings and ceramics, and it has his characteristic side and frontal views of a human face. Warhol’s painting also displays an open composition that gives it what may be described as a Mediterranean freshness. Significantly, the painting incorporates the use of complementary colours that are opposite each other on the colour wheel, blue and yellow, which together with the black give it a highly dramatic visual impact. 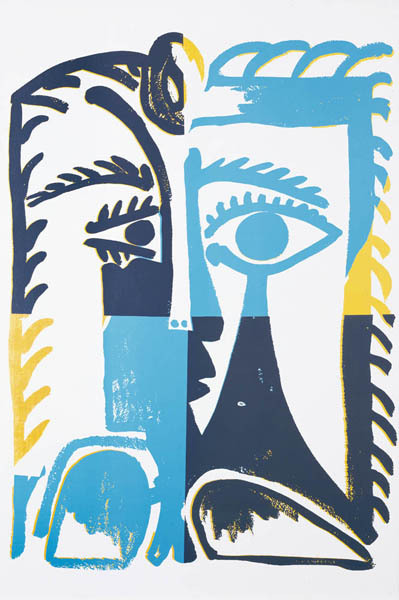 It has the reductive qualities of Picasso’s ceramics, with their loaded brush lines and their slip-trailed simplicity; as well, the painting incorporates the frontal and side-on stylised facial features as found in his famous painted torso studies and portraits of Dora Maar in the late Thirties and his wife Jacqueline in the early Sixties – works that are well represented in New York’s renowned public art galleries. Taken in total, these stylistic factors make it stand out from its nearest comparisons: Head (After Picasso) of 1985 in the David Teiger collection in New York and Head (After Picasso), also of 1985, in the Thaddaeus Ropac collection in Paris. These latter two slightly smaller works display a certain verve of handing and monochromatic power, yet both seem almost directly derived from Picasso’s four drawings published in Christian Zervos’s early publication Pablo Picasso (Paris, Cahiers d’art, 1932, vol. 19, nos. 389, 394, 396, 393). Certainly, these two related works display a type of raw visual appeal of the sort Picasso was engaged with in the Thirties; however, their “stamped” emblematic qualities and primitivist blocked-in and closed-in striated areas are not evident in the present painting. By comparison, the present painting, Warhol’s Head After Picasso of 1985 exhibits an “open” Mediterranean quality, as do Picasso’s related works, and its faïence-like casual freshness radiates a casual ambience more in keeping with Picasso’s celebrated paintings in the Sixties. Warhol was born in 1928 in Pittsburgh, Pennsylvania and was the third and youngest child of Lemkos-Rusyn (sometimes called Ruthenian) parents who separately migrated to America in 1913 (father) and 1921 (mother). Warhol’s parents Andrej and Julia Warhola came from the very small village of Miková near the border between Slovakia and the Ukraine and were devoted members of the Russian Orthodox Church. English was not spoken at home (they spoke “Po Nasemu” (Amongst Ourselves) – a very obscure mix of Ukrainian, Hungarian and Polish) and Warhol only started to learn the local language when he commenced school at the age of seven at Holmes Elementary School. Warhol was a sickly child who suffered from chorea and developed a very strong emotional connection with his mother that lasted for the rest of his life. During his childhood recuperation he immersed himself in current films and the young Warhol developed strong obsessions with the Hollywood child stars Shirley Temple, Mickey Rooney and Freddie Bartholomew - the bittersweet dislocations of self and non-self that flowed from the filmic glamour and cultural differences of these popular movies stayed with Warhol all of his life. The bruising inner pain of a “this is them” and “this is me” psychological split stared here. Warhol’s first illustration commission in New York was given by Glamour magazine and this was followed by further work from the magazines Vogue, Seventeen and Harper’s Bazaar. These early modish jobs may account for the fey and foppish attitudes that Warhol adopted later when he became famous as a way to mask his hurtfully humble origins. He always remained aloof and removed as though he was immersed in an aesthetic otherworldliness. The actual truth was very different: Warhol now emerges, like the wonderful French writer Marcel Proust, as a highly sensitive homosexual who was deeply attached to his mother, was painfully aware of his physical appearance, was contemplative and thoughtful and used the external world as a seedy pool in which to gaze for inspiration before scurrying back to his homely haven for a welcoming bowl of borscht. He did not have to act crazy like Salvador Dalí, he let others do that for him – he just wanted to hang around and watch “crazies”, as he called them. He seems to have taken to heart the American artist Stuart Davis’s definition of the modern artist: the new artist of the Sixties had to be “a cool spectator at an arena of hot events”. This is a typical Marshall McLuhan-like aphorism and it has a lot of truth in it. Like Chauncey Gardiner, the central character in Jerzy Kosinski’s novel Being There, who also liked to watch, Warhol was popularly credited with sibylline wisdom just because he was there, saying little, but noticing everything - a selective surveillance lens on American Society. Warhol was intensely private and nobody was ever invited to his home at 1342 Lexington Avenue in New York. He died in 1987, following complications after a gall bladder operation and an allergy to penicillin at the Cornell Medical Center of New York Hospital. A funeral service was held at St. Patrick’s Cathedral and attended by over two thousand mourners - later, the rooms at his home were found to contain so much collected and meticulously documented popular culture material, craft objects, jewellery and antiques that it took nine days to auction them. Such was the nature of the man and the work that in 1989, The Museum of Modern Art in New York presented a large retrospective of Warhol’s art and it travelled to Chicago, London, Cologne, Venice and Paris. Seen in context, Warhol’s Head after Picasso of 1985 stands as a distinctly unique tribute and homage from one famous artist to another. The present painting is a singular departure from Warhol’s more common reflections on the products and vagaries of modern life – little wonder then that he kept it at home for himself. Fitzgerald, M., Picasso and American Art, Whitney Museum of American Art, New York and Yale University Press, New Haven and London, 2007. Galerie Thaddaeus Ropac, Heads (After Picasso), Salzburg Villa Kast, 19 July-31 August 1997. Rosenberg, B.; White, D. M., Mass Culture, Free Press, New York, 1957. McDonald, D., Against the American Grain, Random House, New York, 1962. Zervos, C., Pablo Picasso, Paris, Cahiers d’art, 1932, Vol.19 in Fitzgerald, M., Picasso and American Art, Whitney Museum of American Art, New York and Yale University Press, New Haven and London, 2007.